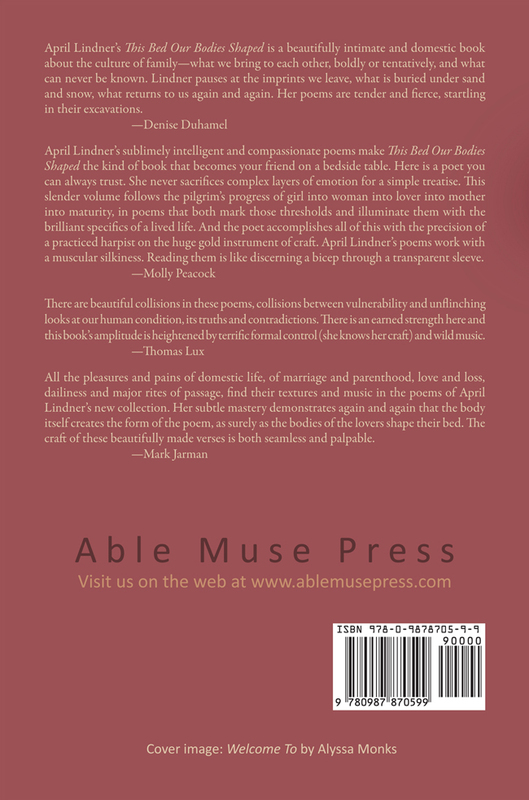 This Bed Our Bodies Shaped from April Lindner is a finalist in the 2011 Able Muse Book Award. This collection is a celebration of the universal human experience—childhood, puberty, parenthood, aging—from a uniquely personal and sensual perspective. Lindner’s craft, which finds masterful and original expression in metrical and free verse, enlivens each experience until we seem part of the scene. Eavesdropping on this engagingly narrated life gives us startling new insights into our own. April Lindner’s This Bed Our Bodies Shaped is a beautifully intimate and domestic book about the culture of family—what we bring to each other, boldly or tentatively, and what can never be known. Lindner pauses at the imprints we leave, what is buried under sand and snow, what returns to us again and again. Her poems are tender and fierce, startling in their excavations. 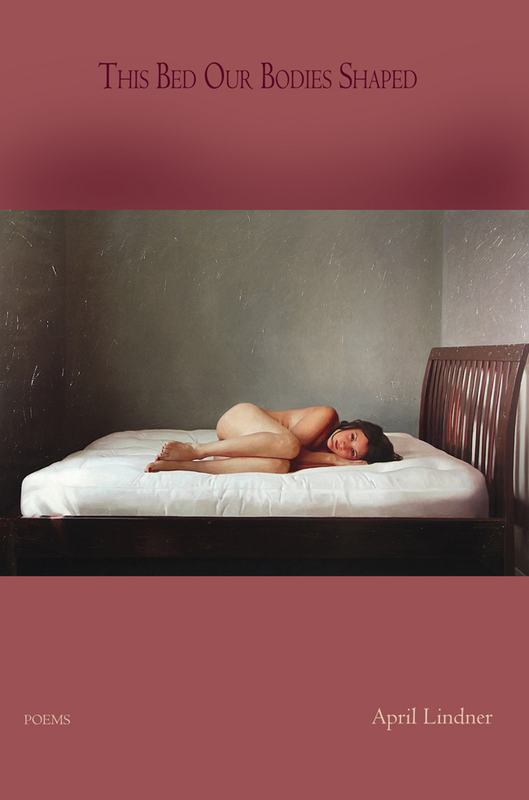 April Lindner’s sublimely intelligent and compassionate poems make This Bed Our Bodies Shaped the kind of book that becomes your friend on a bedside table. Here is a poet you can always trust. She never sacrifices complex layers of emotion for a simple treatise. This slender volume follows the pilgrim’s progress of girl into woman into lover into mother into maturity, in poems that both mark those thresholds and illuminate them with the brilliant specifics of a lived life. And the poet accomplishes all of this with the precision of a practiced harpist on the huge gold instrument of craft. April Lindner’s poems work with a muscular silkiness. Reading them is like discerning a bicep through a transparent sleeve. There are beautiful collisions in these poems, collisions between vulnerability and unflinching looks at our human condition, its truths and contradictions. There is an earned strength here and this book’s amplitude is heightened by terrific formal control (she knows her craft) and wild music. All the pleasures and pains of domestic life, of marriage and parenthood, love and loss, dailiness and major rites of passage, find their textures and music in the poems of April Lindner’s new collection. Her subtle mastery demonstrates again and again that the body itself creates the form of the poem, as surely as the bodies of the lovers shape their bed. The craft of these beautifully made verses is both seamless and palpable. April Lindner’s first poetry collection, Skin, received the Walt MacDonald First Book Prize from Texas Tech University Press. Her novel, Jane, a modernization of Jane Eyre, was published by Poppy (Little, Brown) in 2010; Catherine, a modernization of Wuthering Heights, is forthcoming in 2013. A professor of English at Saint Joseph’s University, April lives in Havertown, Pennsylvania, with her husband and sons.